Do not confuse this with the terrible Sylvester Stallone film about the same character titled Judge Dredd. That film was close to the Batman and Robin mindset: "It's a movie based on a comic book so let's make it without any depth, substance, or reason to care." The 2012 film goes in the exact opposite direction. Whereas the 1995 film was a silly near-comedy (the presence of Rob Schneider prevented any seriousness), the modern version is a serious thriller. Set in the future, most of the world is unlivable. Human civilization crowds together in mega-cities. Because of the chaos that so easily erupts, justice must be swift. So the cities have combined police with judges. So when these new judges respond to calls, they not only arrest, but judge and pass sentence (even death) right there on the spot. 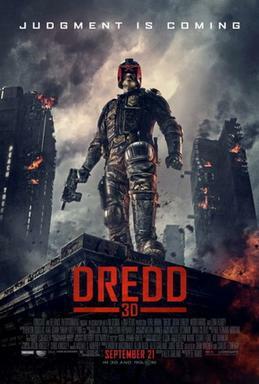 The movie centers around Dredd (Karl Urban), a stoic and mysterious figure who we never see behind the helmet. Like Darth Vader, this creates an imposing aura of intimidation. Dredd is partnered with the mildly psychic rookie Anderson (Olivia Thrilby). She has severe moral reservations about acting as judge, jury, and executioner, but she is placed on duty with one of the most brutal of the law enforces in Judge Dredd. One of the things that makes this movie work so well as opposed to the convoluted original is that it actually has a deceptively simple plot. Dredd and Anderson enter a high rise building to do a routine arrest. These buildings stretch high and hold populations the size whole neighborhood cities. The interior is dark and bleak like an urban ghetto enclosed in run down apartment building. The problem is that the person they are arresting has information on the crime boss of that building, Ma-Ma (Lena Headey), who specializes in selling a drug called Slo-Mo which makes everything you experience feel like it is in slow motion. Before Dredd and Anders can leave, Ma-Ma locks down the building. She then makes an announcement to everyone in the building that she will greatly reward them if they kill Dredd and Anders. The rest of the movie is race to see which happens first: Dredd and Anders can make it to the top apartment and stop Ma-Ma or Ma-Ma and the rest of the building kill the judges. There is no winking at the camera in this film. Some might find it humorless, but instead I found it sobering. The despair the people felt was palpable, but the forward momentum of the story kept it from weighing the narrative down. The objective was so clear that I could easily assess their progress and their setbacks. And with the darkness of the film, the outcome of the journey always felt in question. The production design was fantastic. You got the feeling that this movie had a very small comparative budget to the first one. But they use the space effectively. The claustrophobia of the building works for the tension but it never feels like you are limited in your scope of the story. And the special effects, especially the ones involving Slo-Mo are so visually engaging. The action is incredibly violent, but it does so with great effect. Because of the violence, we fear much more for our heroes. Even those who come after them are given some sympathetic treatment. Most of the residents are pushed around like the peasentry under a feudal lord Ma-Ma. They either obey or they die. And while there is a message here about urban corruption and police indifference, it never feels preachy. The performances should be noted here too. Above all Urban knocks it out of the park. Because his face is obscured the entire film, he has so much less to work with and yet he makes a much bigger impression with this character than Stallone ever did. Dredd isn't just a character, he is a presence. When characters speak about him in hushed tones, Urban's presence legitimizes that awe. You feel his power, his control, and his rage. Thrilby more than hold her own. Rather than throw her in as some kind of weird eye-candy, her youth and beauty work to underscore the ugliness of Dredd's world and her own inexperience. Her character takes the most significant journey and Thrilby gives it everything she has. And you would need a very strong actor as a villain to match up the power of Urban's performance the titular hero. And Headey also brings all of her charisma and menace to believably portray a person who could coldly order the deaths of entire families to increase her power. Dredd is not a pleasant movie. But it is an excellent one. It is a reminder that when you take comic book movies seriously, you can do something pretty special.